Do you want to have full control over how you use your time? Designing your own lifestyle is possible by creating work that works for you as Josh Hoffman will tell you. He’s a digital marketing strategist and a digital nomad. He was working from Thailand when I spoke to him for this interview. He’s been working for himself for almost 5 years now. 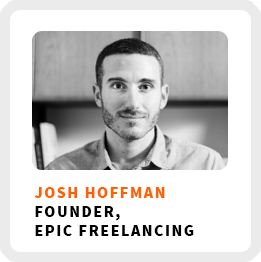 He’s the founder of Epic Freelancing, teaching you how to make a 6-figure income as a freelancer by mastering the business of freelancing. Honestly, this guy is a great example of what it means to be a lifestyle entrepreneur, designing a business that works for your lifestyle. Build confidence through small wins. Reverse engineer your goals from the “why” and the “what” and then figure out the “how” based on those. How Josh quit his job with no plan and how he cobbled together some freelancing gigs based on his existing skillset. Transitioning to working for yourself is a bumpy process, so Josh advises to wear your seatbelt because growth comes from getting through those bumps on your journey. Core work activities + habits: 1) Proactive marketing through content creation. 2) Personal branding by interweaving personal and professional aspects. 3) Be as time efficient as possible. 90-day goal: Continue to build out different offerings on Epic Freelancing. 1) Immerse yourself. Understand all the roles that feed into the work you want to do. 2) Learn how to sell yourself. Don’t get so wrapped up in your services that you lose sight of how to market the ways you can help clients to save money and/or make money. 1) Reverse Engineer your goals. Figuring out things as simple as where you want to travel or what you want to do is key. Then you can fill in the holes of how to get there.